— SPYCAM: The Vex Robotics System will feature a “Spycam” for live transmission to TV or USB. — GRIPPER: The Vex system may even include sound – and the claw, still in development at the time of this post, will be able to pick up a feather, or a 12-ounce soda can filled with liquid. — VERSATILITY: The system will offer an endless combination of robotic activity and learning experiences, with over 300 parts that allow for the individualized design of robots that can be programmed to perform automated functions or be operated by radio control. The system has been designed with versatility and ease-of-use in mind. 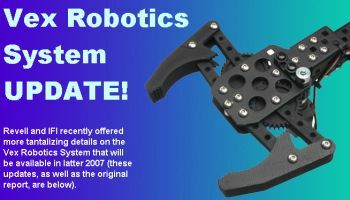 Variants of the Vex Robotics System will be easily constructed in less than one hour, and the robotic systems will move with agility while gripping, grabbing and exploring. We caught up with senior exec Rich Schneider and asked him to recap the upcoming release. “Revell-Monogram is ready to enter the retail market. Our Vex Robotics System is the answer to the merging toy and consumer electronics departments of mass retailers. Kids will think Vex is a cool toy and parents will see the educational value in the Vex Robotics System,” said Schneider, president and CEO, Revell Monogram. Revell Monogram expects the Vex Robotic System to hit retail shelves Fall 2007. Trossen Robotics carries the current VEX line here. Hasbro has added a Pony to their FurReal line of robotic toys. The BUTTERSCOTCH pony will amaze kids and adults alike with her level of “awareness” and realism. She can move her head up and down, and back and forth, and her eyes open and close. Sensors enable BUTTERSCOTCH to respond and interact with the child. When her mane is brushed, a child will hear contented whinnies. When her ears are tickled, she will turn her head and try to find you. When she gets hungry, she’ll happily “eat” her very own carrot. And, when she’s had enough, she’ll shake her head to let you know she’s full. Petting her muzzle will cause her to sniff! With built-in light and sound sensors, the BUTTERSCOTCH pony can tell what is happening around her. If it suddenly gets dark, she may become frightened and need a hug from her caregiver. She will also turn her head in response to noises, and relies on calm, soothing voices to settle her. Whether grooming her, playing with her or even climbing on her back, pretending to gallop into the sunset, the BUTTERSCOTCH pony can be a child’s best friend and a parents’ solution to satisfying their child’s greatest dream without having to build a barn. Hasbro’s highly successful FURREAL FRIENDS line was launched four years ago with the birth of FURREAL FRIENDS CATS and KITTENS, followed the next year with the introduction of FURREAL FRIENDS GO GO MY WALKIN’ PUP. In addition to BUTTERSCOTCH MY FURREAL FRIENDS PONY, the latest addition to the family is the FURREAL FRIENDS CUDDLE CHIMP, who anticipates hugs and goes bananas when you tickle his feet or feed him from his banana bottle. 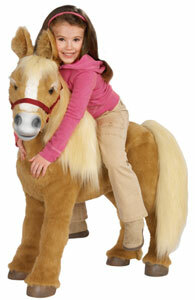 BUTTERSCOTCH MY FURREAL PONY is appropriate for children age four and up. Scheduled for release in Fall 2006, the approximate retail price will be $299.99. The line also includes a robotic Chimp. This guy looks a lot more cuddly than Wowwee’s version! CUDDLE CHIMP is the lovable, huggable baby chimpanzee that just adores being cuddled! He can reach out to give you a hug and loves to clap his hands when heâ€™s happy. Watch his facial expressions change and listen to him make realistic baby chimp sounds. Pet the soft fur on his back while youâ€™re cuddling him and be sure to â€œfeedâ€? him his banana bottle when he gets hungry!